A master of any craft must be fully acquainted with the obstacles in his way and with those who seek to oppose him. Accordingly, I spoke with John, former security supervisor at the Hudson's Bay Centre. Disproving my belief that security guards are little more than well-trained bullies, John was kind enough to share all his department's strengths and weaknesses, and let drop a few additional interesting tidbits. Just to make sure John was telling the truth, Infiltration staff took a trip to the centre. If you'd like to take a visit as well, the bank/office tower/shopping mall/movie theatre/hotel/apartment megacomplex consists of the entire city block at the northeast corner of Yonge and Bloor. For those who don't know Toronto well, the centre is located atop Yonge-Bloor subway station, Toronto's busiest subway station. The buildings are not very old (1974), but still have their fair share of nooks. I: What was your title at the Hudson's Bay Centre, and what were your duties? J: I was security supervisor. My main duties were basically taking care of the building. During the daytime hours, I had to make sure people were behaving , check all the areas at least once a shift to make sure all the fire codes were kept up and nobody hiding, which happened once in a while, we had a lot of bums in that area. During the evenings, when nobody was around, making sure all the doors were locked, nobody's hiding, checking all the fire areas and fire equipment. With the subway, the Yonge and Bloor subway, access had to be closed between 2AM and 6AM. I: What were your qualifications for the job? J (long pause): When I was hired by the company? J: Well, I had a journalism background, so basically that was completely different. I did a basic test, kind of like a general knowledge test, and then once we were hired we had a one-day orientation course and that gave us a brief overview of everything. I: What do you remember of the questions on the test? J: They weren't even security questions, just ... maybe you could call it an IQ test. There was a psychological test, too. I didn't realize exactly what it was until after, but it asked, y'know, "describe yourself as..." and had multiple choice answers. I heard that they put that in as a computerized test and used it to figure out, well, this guy is a psycho and this guy isn't. The Hudson's Bay Tower is the 23rd tallest building in Toronto. I: What was your position when you were hired? J: Security officer. I started out as a console officer, sitting behind the desk, answering phone calls, directing people, and worked my way up after about six months. I: What on-the-job training did you undergo? J: I read lots and lots and lots of manuals. Big binders filled with information on the Hudson's Bay Centre site, fire safety procedures, first aid procedures, and how to deal with people. Plus, in all my time there with Intercon, three and a half years, I must have went to about 20 different courses on almost everything imaginable, including a weekend-long self defense course where we basically wrestled each other and handcuffed each other and got bruised and afterwards we were qualified self-defense types. I know all the pressure points now. I: What were some of the other courses? J: There was access control, where they talked about locks, keys, elevator access control with cards, smartcards, magnetic strip cards. We learned how to keep people out of the building. To become a security supervisor with Intercon, I had to take ten courses and become a Certified Security Professional. I: About how many people did you work with at one time? J: Three. During the day, there were three others, and during the afternoons and evenings there were two others. That's just security  obviously there were cleaners, engineers and other people I had no authority over. We worked rotating shifts, and when I worked at night it was just the three of us. I: What were your co-workers like? J: There were a lot of different personalities. There were two main guys. The first guy was a very thick, muscular Chinese guy named Dean, he was a really a great guy, really friendly and helpful, and he was kind of my bodyguard I guess. And then another guy was a tall, muscular black guy, his name was Carl, they were about the same personality, very friendly and helpful. They were great guys to work with. The supervisor and the patrol officer would patrol the building together, and then the console officer was the person who sat down. I: So just one person was in the security office at any time? J: The console officer had to sit at that desk all the time, because that was where people phoned in emergencies, and that was where people would call if they got trapped in any of the 32 elevators, so they had to stay there. I: You alluded to this before, but did you ever have trouble with derelicts trying to move in? J: Yes, lots. Not so much the Hudson's Bay Tower, but other parts of the complex, such as the parking lot, the mall  there's a lot of little nooks and crannies around there, sometimes in the stairwells, the apartment building, Rock and Roll Heaven underneath, do you remember that? I: The security people had hooked these up? J: Yeah, to entertain us while we patrolled it. Sometimes we'd go down there on the midnight shift and sit on the couches and just relax, when nothing else was happening, and eat our lunch and stuff. It was a comfortable place for someone to move in. It wasn't on my shift that they moved in. I wasn't the supervisor then... my supervisor wasn't very diligent about checking the place. They were there for a week without anyone checking it. I: Did they get caught? J: My friend Dean went down there and walked in on them. They took off out a door, but he grabbed a couple of them and called his supervisor. I think he got two of them and about three or four got away. The two who were caught were arrested and I don't know what happened to them after that... probably just given a wrist slap. They were street kids. They kind of made a mess but the place was a mess anyhow. I: Did the security department ever have trouble with employees? J: Yeah. There were a couple girls who had bad tempers and flipped out. One girl, a big girl, arrested someone on her own, when her supervisor told her not to. But she had to, y'know, go with the flow, or she could be charged with assault. When you grab someone you have to arrest them or if you don't you could get charged with assault. So they lectured her, called her down, got the cops in, I think she was fired on the spot. I: What about employees outside your department? J: There was a cleaner once, there were about 15 or 20 cleaners on at a time, and this one stole something I think. He was caught and he was fired, but he kept coming back, though not to cause harm or anything. He had been banned from the site. If you get arrested, you get banned from the site for a year, it's just automatic. So he came back, and I said, "You're not supposed to be here because of the ban, I could arrest you." And he was kind of crying and said he was sorry, and I said I was sorry but walked him out and said please don't come back. I think that was about the only one. I: Did the hotel, the apartments or the offices have security departments of their own? J: There were about 20 or 30 Worker's Compensation Board floors. They had a staff that walked around and they didn't do a whole lot, they were just there mainly to show a presence. They controlled the passcard system. There were probably a few thousand of these magnetic passcards, and they had to shut off the old ones and activate the new ones. Whenever something happened, like some kind of emergency, they called us. We were charge of the entire complex. The hotel didn't have any security of their own. Rock and Roll Heaven had bouncers, we helped them out once in a while but they pretty much handled themselves. I: Approximately how many security cameras are placed around the complex? J: Not a whole lot for a large place like that, probably only about five or six. I: Really? Wow. Were they designed to catch people unawares, or to be an obvious threat? J: No, the monitor for the cameras was located at the console, and the console officer had to watch it and if he saw someone doing something he had to call and let the other officers know. The monitor was just one small screen, it was horrible quality too, black and white, you could hardly see anything. Sometimes it was helpful in spotting people coming in the big loading dock in the back  the console officer would see it, and tell the supervisor someone was trying to sneak in and we'd go and meet them. I: Approximately how many doors are alarmed? J: In the Hudson's Bay store, probably three or four per floor, times five. That's it. I: When an alarm sounds, what action does the security department take? J: Those alarms were hooked into the fire alarm system, so the fire alarm went off. So we went to the fire panel and it would tell us which floor and which doors, and then we would know immediately what it was. I think it only happened once or twice. We never did find anybody ... it was probably just someone who left and didn't think the alarm would really go off. I: Well, I can't blame them, most doors that claim to be alarmed really aren't. So what's the procedure in the event of a normal fire alarm? J: Well, nobody does anything. The patrons don't care because it happens so often, so it doesn't scare anybody. But the fire department is notified, and they'll rush, you can't stop them from coming. The security officers look at the fire panel, and a light shows us where the alarm was set off, and we go there and usually meet the fire department. Then they go home. I only think there might have been a fire once.... One time, there was some smoke from a coffeepot that had been left on the burner, and the sprinklers took care of it right away. I: So what are those metallic antennae that hang down from the basement roof? The repeaters for the radios. The radios only have a certain transmitting distance, so the repeaters help boost the signal strength. You could probably find hundreds more if you looked carefully. I: Are there motion detectors anywhere in the building? J: No, no motion detectors. Signs like this are scattered throughout the stairwells. Does 'beyond' mean 'lower' or 'higher'? I: Okay. 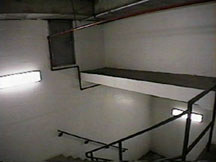 A sign in the stairwell leading up from the security department reads "motion past this point will cause an alarm to sound". Why? J: Why? I don't know. That stairwell goes up past the Bay store and the mechanical rooms. You might be able to get out on the roof, and they probably didn't want anyone to get on the roof because they could tumble. Also, it leads into the boiler room. So that's why. I: I went past that point and no alarm sounded, but then I tried a door two floors beyond that point and an alarm sounded beyond the door. After that I calmly made my way back down to the security floor and left without anyone seeming to notice or care. Do you have any idea why no-one cared? J: I don't know what that alarm was. I should have mentioned before, but in the Bay store, they didn't have security guards but they did have about four or five loss prevention people on. We rarely ever went through the actual Bay store. That alarm might be something that they set up. I: If it had been one of your alarms though, would the console officer have come out of the security department to get me? J: The console officer has to stay there all the time, doesn't matter, unless there's a meteor coming down on their head, they're not allowed to leave. Am I giving you hints here to sneak around? I: Oh yeah. I guess you didn't carry any sort of weapons with you? J: Well, we had a little black Maglite flashlight. And we weren't, by law, supposed to use them, but it's always sorta there, and I think I might have had to use it once or twice to poke a pressure point. My friend Dean had an collapsible baton... they're legal in the US, for cops to use. I don't think they're legal in Canada, but he got it through mail order. He never did use it on a person, but it was always there. This area, accessible by heading up some stairs in the security maze, looks bizarre even when it isn't a poorly-spliced panorama. One must walk across the 2-foot-wide platform in order to access the 3-foot-tall door at the left, which is locked to my immense frustration. The minute cubby-hole pictured at the right is usually covered with a small plank of wood that is easily removable. The entrance and the tunnel just beyond it are perhaps a foot wide and a foot-and-a-half tall, so only tinier explorers will be able to crawl through and see this nook's wonders. The tunnel is very small, so small that it would be impossible to turn around, and very dark, so bring a flashlight. It travels a short way and then opens into a sort of man-made cavern under some steps, with a dirt floor and lots of pipes. Imagine living in a cave at the corner of Yonge and Bloor! I: What were the centre's hours? J: It was only closed between 2AM and 6AM, even on Christmas Day it was open because of the subway. And even at night it was impossible to keep it fully closed. There are a few ways in after hours. The parking area is hooked up to the mall elevators, and you can enter there, so you can always get in. Sometimes we'd find people walking around in the mall at 3AM and we'd just say to them, "hey, it's closed." I: So you didn't arrest them? I: Or so they told you. J: Yeah, well, we believed them. I: How often were the police called to the complex? J: Every time when you arrest someone you have to turn them over to the police immediately. As an average, probably once a week. I: Besides calling the police, what other methods of restraining or punishing offenders were available to you? J: We could physically remove them from the area. No problems with that, just pick a person up and throw them out on the sidewalk. A lot of times instead of going through the hassle of arresting someone, like a bum, or someone who has been bothering patrons, you just go and talk to them and give them a little ticket, saying they can't come back for six months or a year. With a kid who was panhandling or something, we'd just say, y'know, I don't hate you but the management doesn't want you doing that, and give them a three month ticket. I: Did you ask for ID when you did that? J: We did... they didn't have to give it to us, but if we ask for it and someone complies, then what problem is that? So when they gave it to us we just copied down the information, gave them a carbon copy and filed our copy. I: The Hudson's Bay Centre is attached underground to another shopping complex and to the Yonge-Bloor subway station. Where did your authority end? Could you run to another building to pursue someone? J: Luckily, 2 Bloor West was also an Intercon controlled building, so we could either run across to chase them, or radio ahead to the guys there and they'd help us out and of course vice versa. Anywhere else, or out on the street, we didn't investigate there, we could I guess but we weren't supposed to. We also co- operated with TTC security. 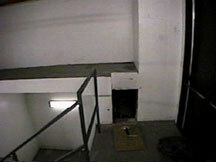 I: Did you ever take advantage of your position to gain access to some of the centre's more interesting locations? J: We used to go up on the roof. On really sunny days it was a nice place to relax and have your lunch, and look down over the site, and it was just so damn high and you could fall just like that! That was a nice place to go. I never had the guts to do it, but the other guys occasionally would go into the hotel suites and relax. Security guards were issued the great grandmaster key in order to allow them to patrol this unsuccessful condo project. I: Did you have a key ring or a master key? J: There was a key ring of about 30 keys. There was one key that was called a Grandmaster that opened almost every door except for a few, and there was another key called the Great Grandmaster, or GGM, and it was like the God key, it got into every single door. We weren't supposed to walk around with the Great Grandmaster. We always did, until one day we were told not to because it was the only one and they were worried about it being broken. Actually, I just remembered something else. What it was supposed to be for, one area, there was a health club and above that there were going to build condos and I think it caught on fire. So there were a few floors of half-finished rooms, and it was kind of dangerous. You got to it by going up a stairwell and using your Great Grandmaster key. We were supposed to patrol it every shift, just to make sure nobody had gotten out there, because if they had there would have been a possibility of heavy losses. I think they didn't get the permit because the concrete was poorly fabricated... it was just a complete write-off area. We had to call in when we were there, just so the building manager knew we were checking it, because it was a very important place. The basements of the Hudson's Bay Centre are truly a delight. Lots of indistinguishable cement corridors, ladders to climb up and down, unlit tunnels, automatically locking doors... the works. It's easy to get lost if you don't have a system. I: Was it the Grandmaster Key that the security guards used to get into the hotel suites? J: No. The hotel suites were opened with the plastic cards. Like I said I didn't do it myself, but I think the passcards were issued to the guests and thrown out when the guests left. I think somehow the guys got a master card-thing and that's how they got in. I: Did you ever have a master pass card for anything? J: There was a passcard for the elevators... they were shut after 9PM and you had to put in a pass card or they wouldn't work, so we had a master pass card for those. I: Were you required to memorize passwords or punchcodes to access certain areas? J: Hmm, I don't think so. There might have been one door in the office tower, a mechanical room door, one of those 1, 2, 3, 4, 5 things. I: I think they're called Simplex locks. How deep do the basements go? J: Well, there's three levels of parking underground. There's Rock and Roll Heaven, which is in the basement  they should have called it Rock and Roll Hell, since it went down. There's the security basement that you know about. I think there's just one floor of actual rooms in the basement. I: Are the engine rooms accessible? J: No, no, you have to have keys for all of them. 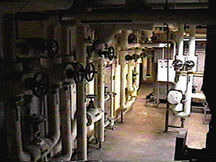 There are probably about 50 mechanical rooms throughout the whole area. J: They're all over the place. There's lots of different tiny little mechanical rooms, and big ones. Between the hotel and the apartment, there's probably one on each of the first 10 or 15 floors, there's one on top of the office tower complex, in the parking lot areas, there's three or four sprinkler rooms. They're all over the place. This interview originally appeared in Infiltration 3, together with an article on how to deal with security cameras.